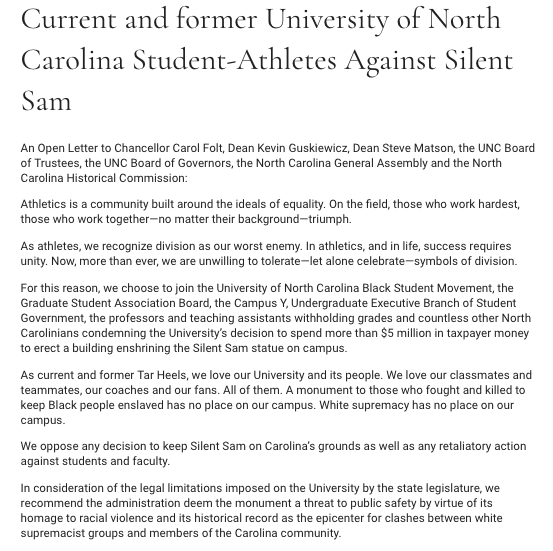 More than 100 current and former UNC athletes have added their names to a statement against returning the Confederate monument known as “Silent Sam” to the Chapel Hill campus. The statement follows a long list of such statements from other groups like the Student Government, Faculty Council and Graduate Student Association Board. The athletes also say they oppose any retaliatory action against students and faculty protesting the monument, including those who have pledged to withhold this semester’s final grades or sit out teaching the first week of next semester over the plan to return the statue. The student represent a wide range of sports from basketball, baseball and football to fencing, track & field, gymnastics and soccer.